The squirt is really just pick pocketing with a specific misdirection technique, but it’s become so common that we will give it a section all of its own. The squirt usually works like this: a perp comes up to the victim and spills or squirts something onto their clothes, often onto their back where they won’t notice it right away. If the perp is being observed, they’ll make it look like an accident. The substance is usually food: mustard; chocolate milk, tomato sauce or something similar. This is the first step. Next either the same perp or their accomplice approaches the victim, if necessary points out the stain, and offers to help clean it off, maybe in a nearby bathroom. The victim is highly distracted by the unexpected mess on their clothes, and by the process of trying to get cleaned up, making it very easy for the perp to pick pocket the victim while they’re doing so. If you’re out in public at a tourist spot and you suddenly find that something has been spilled on you, remember that it probably wasn’t an accident. Forget about trying to get it cleaned up right away. Keep your hand on your wallet, get out of the area fast, and definitely don’t accept help from any strangers. Also, be wary of anyone doing a bad impersonation of a tourist, as often the perp in this type of scam will pretend to be one in order to deflect suspicion. It would be good (or at least better) if the only robberies in Buenos Aires were of the pick pocketing / bag snatching type, but unfortunately muggings and shakedowns – where violence or the threat of violence is used – do occur. Usually they happen at night and in quiet areas so that the victim won’t be able to get help, but daytime muggings in busy areas can and do occur. Make yourself a smaller target. Muggers pick victims who look rich, so don’t wear clothes that mark you out as foreign and/or a tourist. That means no cargo pants, no flip-flops or sandals, no expensive hiking clothes, no trendy daypacks, no sunglasses and none of those dorky short-sleeved shirts. Never stop to talk to strangers in the street, as a lot of muggings start this way. Forget about being polite – muggers will use your instinct to be polite against you. If someone starts talking to you (even if it’s only to ask the time) just smile, shake your head and keep walking. Replace your Rolex with a cheap Casio, your Blackberry with a budget Nokia, your Fendi handbag with a replica, your iPod with a generic MP3 player, and your Apple MacBook Pro with an Asus netbook. You can never totally remove your risk of getting mugged, but you can make sure that you won’t lose anything of significant value if you do. The above advice works well for most people. But what do you do if you’re a keen photographer with expensive DLSR gear? Camera gear is a prime target for thieves, but you can’t leave your camera at home (that would sort of defeat the purpose), you can’t conceal it if you want to use it, and when you’re looking through the viewfinder you’re distracted from what’s going on around you. -Consider swapping your DSLR for an old second-hand film camera that isn’t worth stealing. Getting film directly processed to digital files is relatively inexpensive in Buenos Aires, and you might discover (or rediscover) a love of film. -Find a friend to shoot with. Muggers prefer lone victims, and while one of you is shooting, the other can keep an eye out for shady characters. When you’re shooting in public places, loosen your camera strap enough so that you can wear it across your body and still get the viewfinder up to your eye. This won’t help if you get mugged, but it will prevent someone from snatching your camera and running (or riding) away. Don’t let this guide scare you. 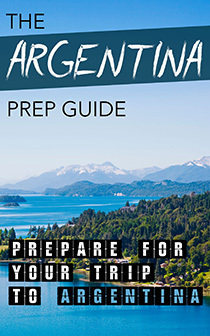 Although robberies do occur, Buenos Aires is a relatively safe city but it is always good to be prepared. Like in all big cities, keep your head up, be aware of your surroundings, walk with confidence and you will be fine! Some great tips, thanks for the information. I have found in the past that carrying a thin wire cable lock is handy to have to attach a bag to a stationary object. It is not theft proof of course. But it does make it inconvenient for the opportunistic thief. such good advice! i think many well traveled people still aren’t prepared for the sneaky thieves in Buenos Aires! In October of 2009, I got mugged in BsAs. I had lived there previously for a few months in 2007, and besides a cab driver pulling a clever trick on me when I was supposed to pay, nothing had ever happened directly to me. But one night, I ventured out alone to find some place to eat (I know, I know… probably not a good idea, walking alone at night as a female) – and as I was walking along Avenida 9 de Julio, a group of four young men approached me, distracted me by starting to talk, and before I knew it, one of them had their arm around my neck from behind. Another started to reach for my bag. My instinct was to start screaming. Amazingly, they all started running away, and I kept on screaming… They didn’t get a thing, and I didn’t get hurt – which was a miracle, in my mind. 2: Wear your bag across your chest. They couldn’t get it off of me, and they really tried. 3: Don’t walk alone at night, even along the busiest street in BsAs, full of tourists, and full of activity. I am a local and got mugged by a teen walking out of university. Twice. So much for blending in! Here’s what I do. If the thief is a teen, probabl high, you don’t really need to worry all that much. They can’t tell uch of what’s going on. I carry a %10 bill in my pocket and an old cellphone. They won’t stop to see hw much money you are handing over or how new your cellhone is. Under no circumstance take your wallet out, the hastle you get from losing your card and IDs is not worth it. If you want to be super prepared, have a dummy wallet ready, with some low denomination bills (and some fakes, if you get some), maybe expired cards. You can get dummy cellphones sometimes, too. They’ll walk away satisfied and never realise they’ve been scammed. Some good tips here. 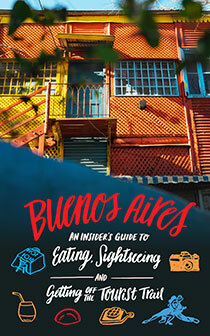 I lived in Buenos Aires for 3 months and I didn’t get mugged but almost every tourist I spoke to did. Like the post says, most of them were by harmless pick pockets but I’ve heard some more intense stories. I love BsAs to death but it’s just a matter of life. I would NEVER put anything of value in my back pocket or in my bag (except for my camera) and I rarely wore my bag on my back (I would usually have it over one shoulder under my arm). I also would only ever take one credit card for emergency and a sufficient amount of cash for the day out with me and whenever I would go to the bank on the corner to withdraw I would go by home first to stash the majority of the cash in a safe place. I definitely encountered a few people sizing me up for robbery in the subte tunnels but I would usually stare them in the eyes, pick up the pace, stick to a crowd or change direction. I also found that whistling a tune when I was in these circumstances was a good way to calm myself and feign confidence. This all worked for me. BsAs is amazing just be smart. Im from argentina, but from a small town were crime rates are really low, and most of the crimes are organize crimes (such as selling drugs, stealling parked cars, breaking into empty houses). It is quite unusual to be mugged, i never met anyone who was mugged in the streets of my home town, i used to walk my dog at 3 am going to different parks, and never felt unsecured. But now I live in BA because of my studies, and in my second month here i got rob 3 consecutive days, in the middle of the day, when i wasnt alone, having nothing worth stealing. I dont go out much because of that, being threathen to death 3 days in a row is a traumatic experience, and i sisnt even had a cellphone! I’ve lived in BsAs for 2 years and have found it relatively safe – I’ve been pick-pocketed once and had a couple of grab and runs on the subte where they got away with nothing and attacked once (not for money, just punched and kicked). I’d previously lived in Iguazu for 2 years and was robbed over a dozen times, including having my house burgled twice….the second time by the police, who also tried to extort money from me with a protection scam. I’d say the best advice is to just give stuff up when you’re being robbed – these days kids are often tooled up and losing your camera, watch or a few bucks is preferable to losing your life. Update: I got robbed on the subte a couple of weeks ago with my 3 yr old son in my arms. About as low as you can get. I was with a few of my friends on the subte yesterday and as soon as we stepped on (about 7 very american looking college kids – blonde hair, glasses, blue eyes, etc.) a man began to pretend to violently vomit in the middle of us as his friends sitting in the seats around us tried to pick our pockets. Most of us were wearing dresses with cross-body bags so we were alright but one guy did get his phone stolen. I quickly yelled that we were being robbed as soon as I figured it out and then pointed at the man I saw who took the phone. The sick man crawled to the end of the subte car and others pretended to comfort him. The man who saw me point then pretended to find the phone on the floor and handed it back to my friend after he realized I knew what was going on. They got off at the next stop and the fake sick man was completely fine. Very creative way of robbing someone. I would guess that it works almost all the time. LOL, That sounded funny. What I meant was, dont carry backpacks etc. Just what you are wearing, you dont need to carry ID with you, just a photocopy will do. Nothing to loose, nothing to worry. Me and my wife are now traveling to Buenos Aires and I am writing this post on Ibis Buenos Aires in front of the Congress. We are taking the subway to avoid taxi scams, but always when we walk on the street with ours huge backpacks something bad happens. Today is my second day here and also the second day that someone spitted some dirty stuff on me and my wife. Yesterday in front of the Hotel La Perla waiting to cross the street someone thrown chocolate milk all over my backpack and in my wife`s hair and ran away. Suddenly another guy crossing the street offered help, but knowing about this we ran away from him. Today the samething happened, but they spitted some liquid with a realy bad smell from the top of a building and suddenly another guy started to “help” us point where the liquid came from so we could be distracted, but we ran away too. We called the police and while we were talking to the police another tourist appeared saying that the same thing happend to him 30 minutes before. We were luck to not get robbed, but we had to wash our clothes and backpacks and it could have been much worse.